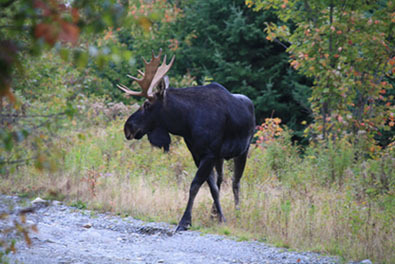 One of the main Maine Moose watching questions we get is "Am I guaranteed to see a moose?" The answer to that question, in a nutshell, is of course no, we cannot guarantee a moose. Our Registered Maine Guides work very hard to give us the very best opportunities of seeing moose, and we adjust our tour times to the dinner clock of a Maine Moose, but nothing in life is ever guaranteed! The month of August, with all of its heat and sunshine, does a good job to drive most of us either to the shade of an umbrella on a windy beach, to the ice cream store, or really just anywhere that has air conditioning. The same is true for our furry moose friends! Even though it has been less than desirable weather, we have been successful in moose sightings 85% of the time so far this August, and just in the past week, that success rate has jumped up to 95%! In 3 out of 4 trips, we see at least 2 or more Maine Moose. Part of what makes a Maine moose watching tour so special with Northeast Guide Service is the atmosphere here in nature. Our group moose safaris head to remote woods ponds where the water is peaceful and the calm in the air compliments the majestic Maine wildlife around us. In addition to moose, we also see many other creatures such as deer, loons, eagles, owls, blue herons, otters, beavers, raccoons, and even an occasional bear. We do our best to observe, and not intrude upon, the wildlife around us. Observing a moose in his or her daily routine, a playful calf toying with his mother, a young bull putting on a show for a nearby cow- we see it all! It is one of the best ways to experience the beauty of the great New England outdoors. As we continue into the end of August and further into September, all of our moose watching tours will be enhanced by the immaculate foliage as summer fades to fall. The moose and other creatures are more plentiful as it starts to cool off, and we have the hands-down BEST opportunities to take pictures of our beautiful area. The time to go see some Maine moose is upon us! Ending August with a Bang! So Many Moose, So Little Time!